Marshall, Michigan - Susan Newell, 69, on the River Walk along the Kalamazoo River. The city's River Walk is part of the North Country National Scenic Trail. Image Description: Marshall, Michigan - Susan Newell, 69, on the River Walk along the Kalamazoo River. 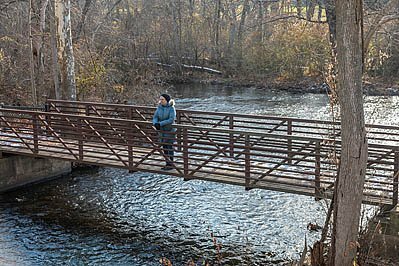 The city's River Walk is part of the North Country National Scenic Trail.